Redsn0w jailbreak tool has been updated to version 0.9.5b5 which brings full support for iPod touch 2G, along with optional support to enable multitasking and wallpapers on iOS 4.0 (formerly iPhone OS 4) on iPhone 3G and iPod touch 2G which otherwise are disabled by Apple. Warning Note: This release is strictly meant for official activated iPhones, if you rely on an unlock, stay away from this release. 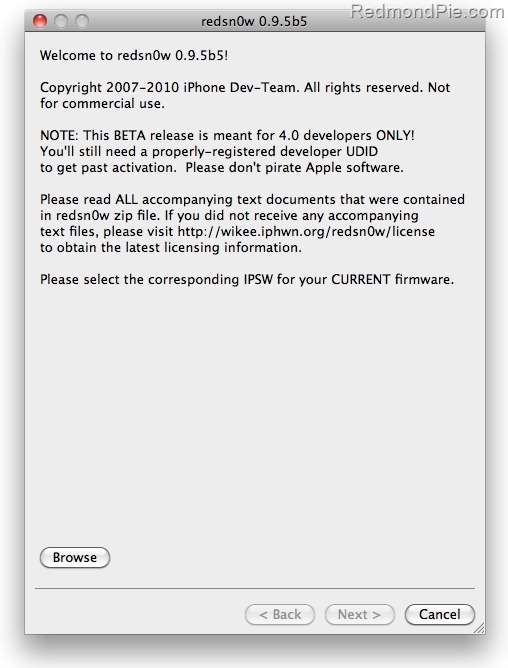 The redsn0w beta has been updated for 4.0GM, and it now supports the iPod touch 2G too. Multitasking and homescreen wallpaper are now turned on by default (Apple doesn’t normally allow this on these 2 devices). Because 4.0GM isn’t yet public, you’ll need a Mac and iTunes 9.2 to use it. Since this redsn0w beta is intended only for those with legitimate developer program access, this shouldn’t be a problem. Just like our other betas, this one intentionally doesn’t “hactivate”. Please wait for Apple’s public release of 4.0 for that part of it. Instructions to jailbreak iPhone 3G on iOS 4.0 GM using Redsn0w 0.9.5b5 are exactly similar to the last release. Please read all the instructions posted here carefully before upgrading and jailbreaking your phone to iOS 4.
iPhone 3GS users should follow the guide posted here to jailbreak iOS 4 using PwnageTool bundles. If you are on iPhone OS 3.1.3, you can follow our step by step guides to jailbreak iPhone 3GS with Spirit here, iPod touch 3G untethered here, and iPad on OS 3.2 here. iso when would jeilbrake for ipod touch 3g 4.0 B availabale ???? Can I jailbreak with Ipodtouch 3g, 4.0 software? hello guys… every time i'm trying to jailbrake my ipod touch after all steps and when is starting reboot the system it remains freezed and nothing happens… does anybody knows what's happening??? Go to http://www.jailbreakme.com ON your iphone or ipod touch. Its so simple! is there a way to use redsn0w to jailbreak ipod touch 2g 4.0 MCmodel? Can I jailbreak ipod touch 2g MC model on 4.0.2?? thank u so much! its working great!!! No, they still haven’t figured that out. But, a good idea would be to go to Apple and ask them to exchange your Ipod touch 2g MC model for a NON-MC Model. I did it, and now I’m using the Redsn0w jailbreak. You can’t jailbreak an MC Model. so as long as the model is not MC it can be jailbroken? hey where do you download the old firmware, everywhere i try to download it – I need a password, any ideas?